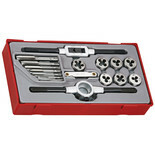 Metric combination tap & die sets from 3 x 0.5mm to 12 x 1.75mm. 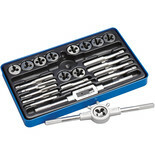 Supplied with tap wrench, die handle, T-handle tap wrench & metric screw pitch gauge. 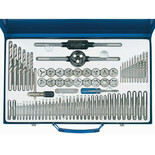 All neatly presented in a metal storage case. 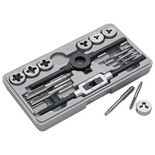 For automotive and general mechanical workshop use this 16 piece tap and die set, made from high quality tungsten steel, will serve to create and repair popular metric threads. 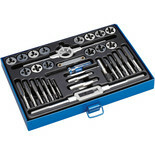 A very useful 32 piece tap & die set, ideal for automotive and general mechanical workshop use. 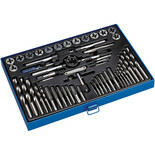 Made from high quality HSS steel, it will serve to create and repair popular metric threads. 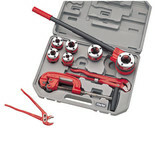 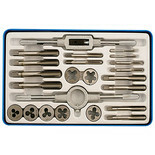 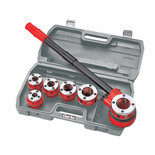 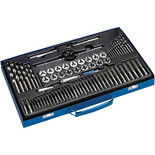 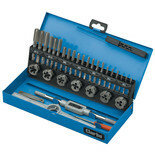 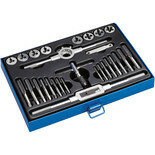 37 piece metric & tap and die set in a convenient metal case for general workshop use. 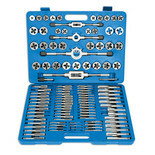 Made from high carbon alloy steel. 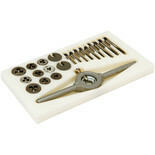 For use on old British cars and motorcycles. 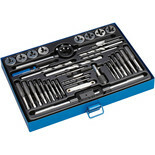 Suitable for cleaning and repairing threads.